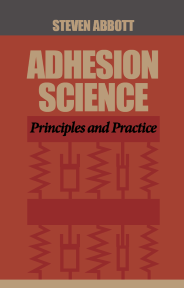 The key resource is my book Adhesion Science: Principles & Practice. This contains everything that I know that can be useful for those dealing with adhesives. 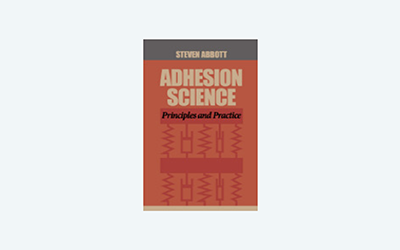 The Principles behind each aspect of adhesion are introduced with the correct scientific formulae but of course I bring the formulae alive via the apps in Practical Adhesion so that you and I can both understand what they mean. The eBook version has live links to click straight through to the right app. The Practice is always the focus - I only introduce the Principles so you can put them into Practice with your own adhesion issues. Setting the scene and getting the units right! Most of what is said about surface energy and roughness is wrong - so let's see why. Strong adhesion starts with intermingling and entanglement from polymers and cross-links. Adhesion depends on temperature and on the speed of testing - and they are equivalent! How do PSA give such strength when all they seem to have is weak surface energy? Knowing how to get both sides of an interface to be happy together via "like attracts like". Adhesion is a property of the system so no adhesion test ever gives you "the truth". Applying the principles to a wide set of practical formulation issues. Given that the website therefore contains a lot of the content of the book, why would you want to buy the book? If you just want a quick answer to just one question then the right section of the website is probably good enough for you. But websites aren't good at doing what books can do which is to provide a strong unified background to the whole field. I am confident that you will get a lot of value from the book, which is why I wrote it. To give you a flavour of the book sample the following 9 short YouTube videos. To my great embarrassment in my warm thanks to Christopher Walford for providing me with the term "Adhesibility" I spelt his name as Warford. My apologies. Eagle-eyed readers have so far found the following errors. p41 I talk of extra "area" being 20μm in 500μm. I am implying multiplication by the same unit width in both cases. p47 and 49 Hopefully on playing with the app it will be clear that the yellow line is the loading curve and the blue is the unloading curve. p147 I got confused between μ and η for viscosity so used different symbols in consecutive sentences. At the bottom of p158 I make the same mistake again, using μ instead of η. A glitch put the wrong app image (but not the wrong app link) for App 5.7, the classic shear test. On p188 I mention the use of DSC scan for finding Tg. It has been pointed out that DMA would probably be more suitable, though it seems to be rarely used for such purposes. p162 Some might prefer "specific heat" to "heat capacity". I was using the terminology if my original source which, regretably, I failed to quote - though he is fully acknowledged in the app. My apologies, therefore, to Sascha Bach at Technische Universität Dresden for failing to mention him in the book. The graph is "illustrative" so lacks labels on the axes. p202-3 The graph shown is the theoretical (and high quality) fit from the Maugis paper to extensive data (not shown in my graph) of peel versus speed for polyurethane strips on glass. p208-9 A clarification is required. App 7.1 is uses the Kaelble peel equation, but the Peel 90° value is an addition from the Bikerman formula. p223 I asked the question "...why not do 3 point test instead?" Dr Lacombe has kindly provided an answer: "Good question and fairly subtle. It all has to do with the singular stress field created in the substrate close to the supporting knife edges. The 4 point bend test puts the knife edges as far away as possible from the central region of the beam where we want the stress to be nice and uniform and fully compliant with classical beam bending. The three point bend puts a knife edge just below the crack region of interest where the singular stress field due to the sharp edge greatly confounds the stress field near the crack region of interest." p242 Equ 7.16 is missing a δ from the top which should be Eshs2δ. p.257 (figure),p258 text, mixed up viscosity with μ and η. Here are some other resources for the adhesion community. All the videos are on my YouTube channel but to reduce loading time of this page I've not included them "live" on the page. All resources (except for the on-line Adhesion course!) are entirely free for you to use with no adverts etc. I teach an adhesion science course via AIMCAL . It's done each year in the USA and Europe, but is also available as an online version I provide some materials which I am happy to share with the Internet community. For a glimpse of what the on-line course is like (and my live teaching style), here's me introducing the Strong Adhesion section of the course. The second is shown in this video Surface Tensions and Energies and is a simple spreadsheet with lists of the critical surface tensions/energies of polymers, their water wetting angle and also a list of surface tensions of liquids sorted by name and by surface tension. Download this handy resource Surface Tensions as an Excel sheet with two workbooks. The third is shown in this video Polymer Molecular Weights and shows how the distribution of MWts in a polymer affect Mn and Mw the number-average and weight-average MWts and the polydispersity Mw/Mn. It also shows how the onset of the Critical Entanglement MWt affects melt viscosity. Download this handy resource Polymer Molecular Weights as an Excel sheet with two workbooks. Adhesion scientists often say "You can't get adhesion without wetting". This is only partly true. You can't, for example, coat a water-based adhesive onto HDPE. Work at National Starch and Arizona Chemicals shows the important point that you don't need wetting to get an adhesive to flow between two substrates. This is explained in the academic paper from Dr Charles Paul of National Starch How Thermodynamics Drives Wet-out in Adhesive Bonding: Correcting Common Misconceptions. The Red Herring video from Dr Evert Smit (who worked with Dr Paul) shows that if you have a drop of water (coloured red) on the HDPE and place another piece nearby, the water jumps to the HDPE - it prefers to be in contact with HDPE rather than air. And when you "glue" two pieces of HDPE together with water they can hold a large weight. Thanks to Dr Smit for permission to use the video. Some smart people are doing some great things with "gecko-tapes" but for most of us, gecko adhesion is far too weak. Well, if you pull in the right way it's amazingly strong, but pull in another way and it's amazingly weak. The Gecko video starring my next-door neighbours shows this. Two ordinary sheets of rubber are impossible to pull apart directly but trivially easy to peel apart. People test for adhesion using a tape test. If you apply the tape to a coating and the coating falls off when you peel the tape, the adhesion is clearly very poor. If the coating stays on it might still be poor, but you wouldn't know it. The reason we tend to use a cross-hatch tape test (where you deliberately create free edges in the coating by slicing through it with a special blade) is that it is much easier to start to delaminate if you have a free edge. This can be readily demonstrated with a roll of household adhesive tape and a bit of a rather stronger test tape. The Tape Removal video shows the roll of tape "passing" a normal tape test (applying the strong tape away from the free edge) and failing the equivalent of a cross-hatch test when the strong tape is applied over the free end. There is a quaint myth that you need roughness to get good adhesion. This is wrong in most cases and is especially easy to show in the case of a pressure sensitive adhesive. As shown in the Roughness and Adhesion video a sticky note adheres much less well to a rough surface than to a smooth one. The video is not a fiddle - it fails 100% of the time on the rough surface.